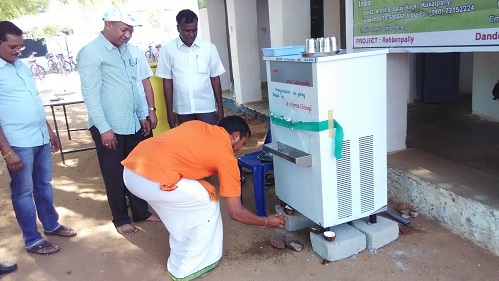 Bighelp donated Water Cooler to Zilla Parishad Secondary School Rebbanpally, Dandepalli Mandal, Adilabad district. Zilla Parishad Secondary School is situated in Rebbanpally village and it was established in 1991. Students from nearby villages namely Rebbanpally, Chinthapalli, Ellaram and Muthyampet are educating themselves from this school. It is co-education school with present strength of 260 students and 15 teachers. The donation program was conducted by Bighelp on 12-Apr-2016 at the premises of Zilla Parishad Secondary School with following personnel and donated the benches.